When walking the streets of the City of London, a visitor or resident can spot on their day to day travels, sculptures in different street corners. Each sculpture holding its own unique story, and I want to share some of these with you. ‘Sculpture in the City’ started in 2011, and is now in its sixth year. It is located mainly in an area around St. Helen’s Bishopsgate church. From June 2016 until May 2017, 16 types of sculptures stand scattered across the square mile. The initiative is to bring more culture to The City of London. The figures or figurines are also a part of educating people, enticing children and allowing them to explore art and culture in the middle of a vibrant city. The first one I’ll tell you about is ‘Charity,’ by Damien Hirst (2002). It is a strong image, a thought provoking 22 foot sculpture featuring a disabled girl (installed in 2015). The girl has her right leg in a splint, and is holding a bear, and a broken into charity box. Hirst’s intention, is to change the way people see disabled people, and charity. The sculpture references the Spastics Society in the 1960s (now the charity Scope), which encouraged people to pity the disabled. This figure is positioned in the middle of the main financial sector of the city. It stands out distinctively to the affluence around it. The statue stood in front of the St. Helen’s Bishopsgate Church and was removed in June 2016. 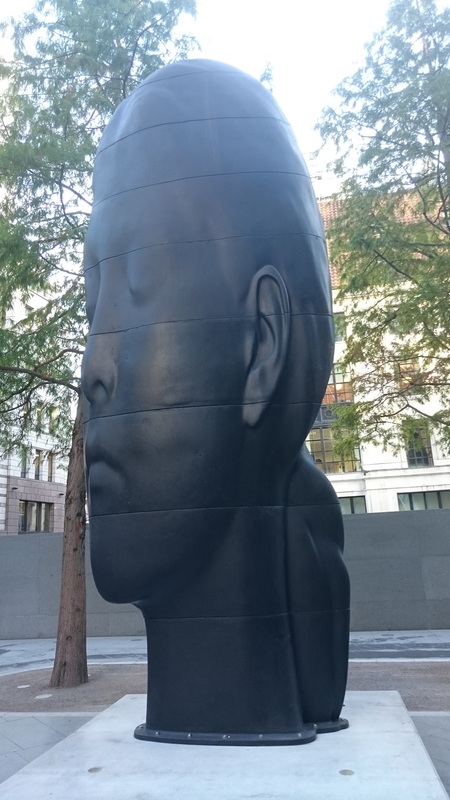 The second one – ‘Laura’, by Jaume Plensa (2013) is one of this year’s sculptures, featured outside the Gherkin at the northwest corner. ‘Laura’ is a portrait of a girl that is not yet a woman, but is not a child. Plensa’s intention was to focus on the openness of Laura’s future at that age. The sculpture is quite dominating, but when looking at it from different angles, the face may be overwhelmed by the surroundings, or in contrast stand out. That depicts the vulnerabilities of the girl, but can also show her loud voice in society. I would also try and capture an image in black & white, and try to reverse the image (as the old film negative) and see the impact. ‘Sunrise. east. July,’ and ‘Sunrise. east. October,’ by Ugo Rondinone (2005). These two masks are included this year at the corner of Leadenhall Street, and Bishopsgate. The masks, are only two of twelve individual masks. Each face conveys a different emotion, enabling the mask to look more human. There are similarities with the giant Easter Island stone heads, which brings culture into the sculptures. You can find these sculptures around St. Helen’s Bishopsgate church. There are 20 in total, have a walk around, and see if you can spot them all. They are all 1-2 minutes’ walk from each other. Lizi Sánchez, created four ceramic paper chains (Candenetas 2016), which can be found in different locations (99 Bishopsgate entrance, Leadenhall Market, The Leadenhall Building, Hiscox Balcany). The chains representing repurpose. I hope you enjoy this open air art exhibition!